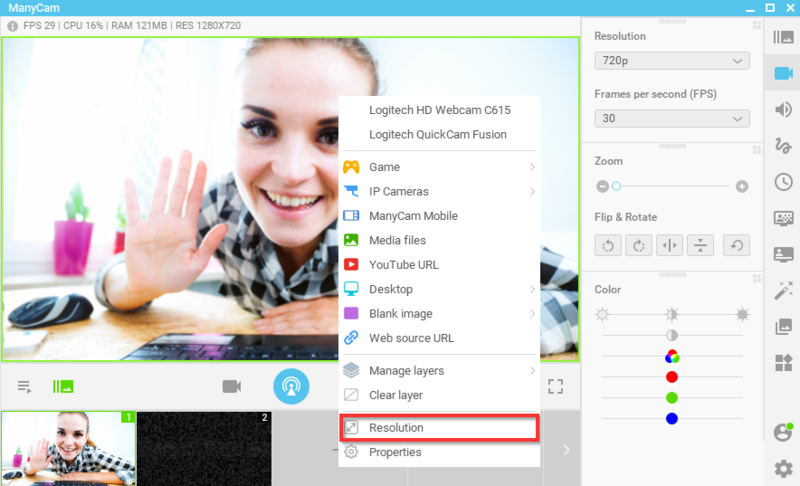 Navigate to ManyCam menu ⇒ Settings/Preferences ⇒ Video and enable the resolutions you require. Most common resolutions for streaming are 720p and 1080p. FPS is the frequency (rate) at which consecutive images called frames are displayed in ManyCam.The higher the FPS value, the more smooth your videos are going to look, however higher FPS rate will also require more computational resources. Recommended setting is 30 frames per second. To adjust FPS, navigate to ManyCam Video tab and select the required value. 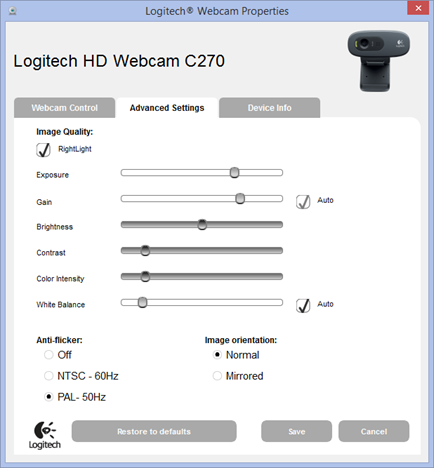 You can access your webcam’s integrated settings to adjust such properties as brightness, contrast, exposure, autofocus, face tracking, etc (properties might be named differently depending on what webcam you use). To open your webcam’s settings, make sure your webcam is selected as a video source, and then right-click on the Main Live Window and select Properties as shown below. In ManyCam, you can right-click on the Start Stream button to see the current video format set in the client. 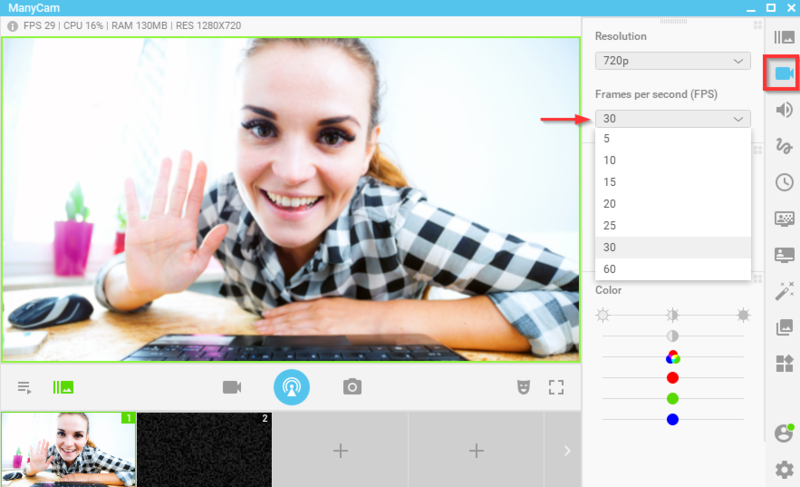 If you see resolution different from that of the selected in ManyCam, navigate to ManyCam’s Video tab and adjust it accordingly to avoid quality loss caused by video scaling. ManyCam allows you to adjust a whole bunch of video settings, however, some apps that you connect ManyCam with also have similar settings of their own. 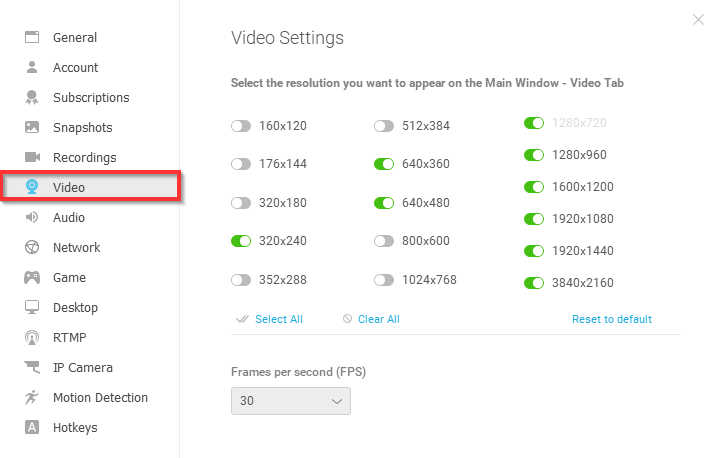 We recommend checking these settings and making sure they match those selected in ManyCam (especially resolution) in order to avoid quality loss caused by video scaling. Resolution is not the only setting you should pay attention to. Some apps, like Zoom, will not deliver HD quality unless you Enable HD in Zoom Settings, despite ManyCam is set to stream in high resolution. Note: this feature is available in ManyCam for Windows ver. 6.5 or higher. 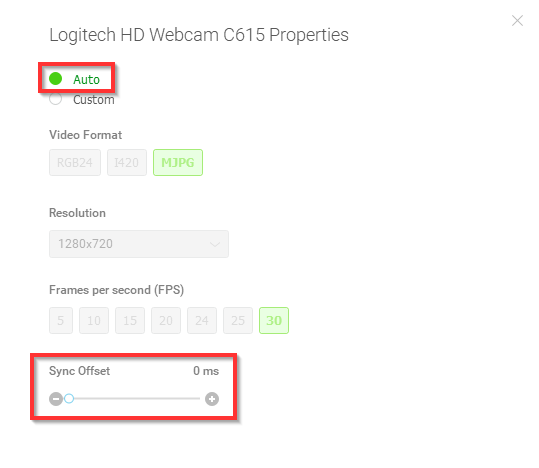 If you experience a lag between audio and video in ManyCam, you can try adjusting Sync Offset to set a custom delay for your video feed. You might need to experiment with this setting to find the correct value. Make sure that your webcam is selected as a video source in ManyCam, otherwise, this feature will not be available. To open this setting, right-click on the Main Live Window and select Resolution as shown below. Sync Offset is located at the bottom of the window. We recommend keeping the rest of the settings set to Auto. Learn How to adjust audio delay using Audio Sync Offset. Note: this applies to ManyCam for Windows ver. 6.5 or higher. Provided you have at least quad-core CPU, you can enable multi-thread processing using the Asynchronous frame transmission property in ManyCam Settings. This will significantly improve the FPS rate. You can enable it in ManyCam’s Settings ⇒ General. RTMP streaming allows you to broadcast directly on Facebook, Twitch, USTREAM and YouTube live events. As opposed to streaming from a browser, RTMP connection is maintained directly between the streaming server and the video player. This ensures smooth video streaming in spite of any fluctuations in bandwidth. 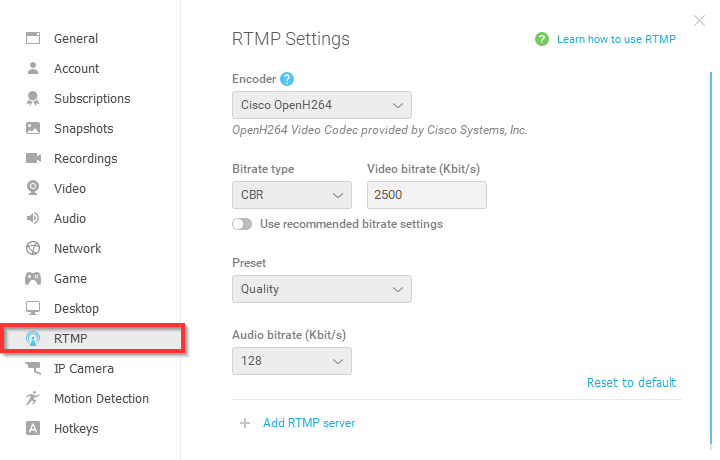 Since it is based on a different technology, RTMP has additional settings of its own. 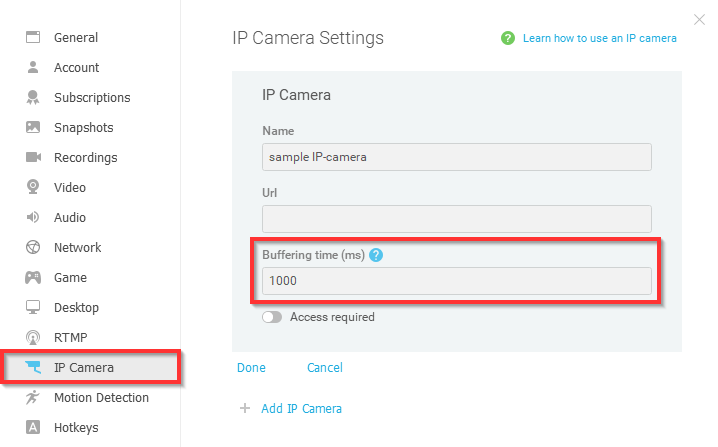 Navigate to ManyCam menu ⇒ Settings/Preferences ⇒ RTMP to access RTMP settings. This option allows you to set the video encoder that will be used for RTMP streaming through ManyCam. Software video encoder is the default encoder available in almost every setup. It does not require any additional hardware and produces quality inferior to that of hardware encoders. 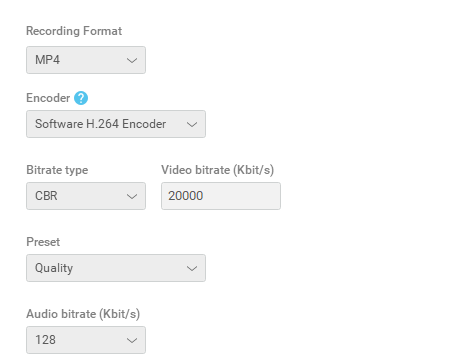 Hardware video encoder is an encoder provided by your GPU vendor. Such encoders work faster and produce better quality; however, they are commonly not supported in older GPUs. Learn more about encoders here. Navigate to ManyCam menu ⇒ Settings/Preferences ⇒ Recordings to access video recording settings. Hardware acceleration is used to offload some heavy tasks from CPU to GPU thus improving the overall performance of ManyCam. With this feature enabled, such resource-intensive tasks as Chroma key or Desktop sharing are expected to consume significantly less CPU power. This feature is currently experimental and is disabled by default. You can enable it in ManyCam’s Settings/Preferences ⇒ General. Note: For Windows only. Windows 8.1 or higher is required to use this feature. This feature significantly improves the quality and performance of video capturing. 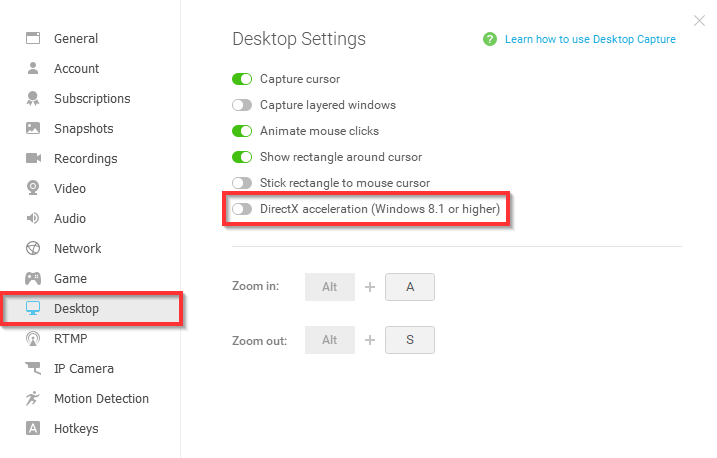 It’s highly recommended that you keep DirectX acceleration enabled in case you have Windows 8.1 or higher. Navigate to ManyCam menu ⇒ Desktop and enable DirectX Acceleration.